Ossus stands as the home of the oldest and most historic of the Orders temples. Originally constructed some time around 25’000 years before the battle of Yavin, it was the temple on Ossus that served as the unofficial center of the Jedi Order until the construction of the great temple on Coruscant in 5000 BBY. 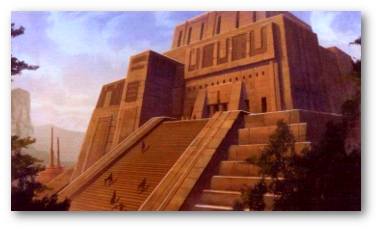 The temple has been destroyed and rebuilt many times over the course of its history, as has the Great Jedi Library attached to it, first built by the legendary Jedi Master Odan Urr millennia ago. Sitting in the heart of Ossus’ rebuilt capital of Knossa City, the temple on Ossus continues to serve as the premiere centre of learning and study for the Orders most dedicated scholars.